This Arts & Crafts Chandelier is an original work of art by H.J. Nick inspired by famous Greene and Greene chandeliers from the early 20th century. The stained glass craftsman chandelier's six-sided, hexagonal pendant shape puts a truly unique twist on this classic design. It is made in the same hand and materials as the original Greene & Greene chandeliers. Furthermore, it has been built to historically correct specifications our master craftsmen. 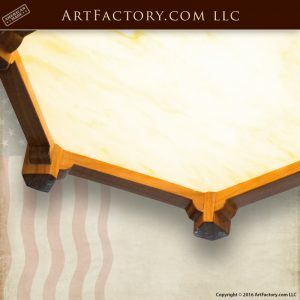 At ArtFactory.com, our original stained glass craftsman chandelier made from solid walnut and ebony wood. This hexagon shaped chandelier is just one of the many custom craftsman lighting designs that have been created by H.J. Nick. This chandelier is handcrafted with genuine fine art stained glass that has been handmade and kiln fired by our expert leaded glass makers. 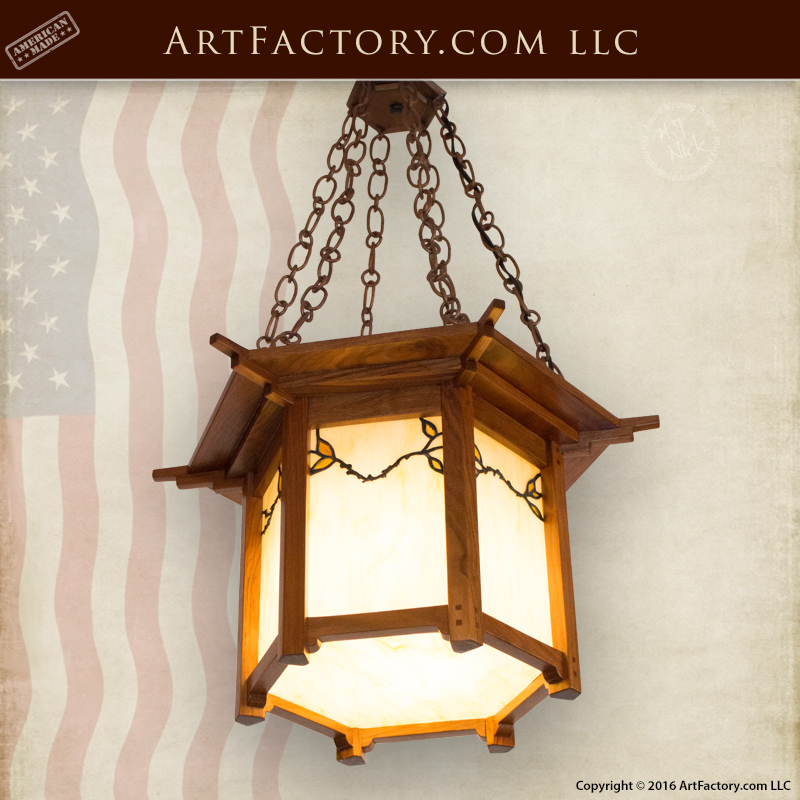 These fine art quality, custom lighting fixtures are built with a solid, full length American hardwood frame. These frames are hand hewn with mortise and tenon joinery. This type of construction ensures a quality of construction that you will not find at any big box retailer. These are not glued together, fast process, mass production products. When we build a custom lighting fixture, we build it to the be that one that you ever need to buy. In addition to top quality craftsmanship and materials, we offer unlimited customization options. All species of wood, and hundreds of stain colors are available to choose from, and we have no limitations on size. Our master craftsmanship ensures that your custom ceiling lights will stand the test of time, and we will create it to your exact specifications. This makes for a custom lighting fixture that is uniquely yours, and will never be exactly reproduced. Building true family heirloom quality and antiquity value home furnishings is our passion at ArtFactory.com. Order your custom stained glass craftsman chandelier in any style and size, and our designers and craftsmen will make your dreams into reality. Hand carved exotic solid old growth woods, along with the perfection of a fine art, hand rubbed finish let every one know that this chandelier is something special. Each custom lighting fixture is made to order so that it fits the personality of each individual client. Sometimes the hand carvings are copied to match the design of other fine art collectables. They may also be taken from personal photos, coats of arms, or other artwork that has personal or family meaning. At ArtFactory.com we are committed to the advancement of the Arts and Crafts Movement in the 21st century. That is why, even today, we manufacture every product using lost techniques from the old world. Call us today at 1-800-292-0008 to speak with one of our design engineers about this stained glass craftsman chandelier, or any of our other, custom made to order products.